Most people can’t live without coffee. It seems like our society practically runs on it. As such, you need to make sure you have the best coffee maker on the market to keep you going! 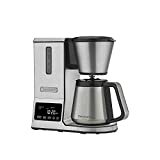 But, with the different types of coffee makers, brands, and prices it can be hard to find the perfect one. Have no fear, we have looked at and compiled a list of the best coffee makers of 2019. Single serve coffee makers are the easiest to use. You load up your pod or grounds, make sure there’s enough water, and go. Cylindrical container with a plunger. Grounds are put in and submerged in water for a while, then push the plunger to press them down. Uses conical filters instead of flat bottomed ones. It can be electrical, automatic machines, or pour-over units. Made of 3 parts: bottom chamber, middle long-stemmed funnel that holds the grounds, and a top chamber for the finished coffee. We use a 2-part system with how we chose our ratings. We look at what insiders think to get a list together. They test them out and know some of the best brands. The only downside is that they may have unknown biases. 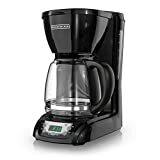 We then looked up each coffee maker from our list on Amazon to see what average customers like you thought of the product. Customer reviews are great because they have no biases. Customers will not hold back from telling people why they like a product, or why they didn’t. They also can explain it in a way that anyone can understand. This is a manually adjustable drip stop brew basket with glass carafe coffee maker. It’s easy to operate and has a quiet brewing process that brews a full carafe in 6 minutes. Its unique copper boiling element rapidly heats water to control brewing temperatures between 196 to 205 degrees Fahrenheit. This is important to get the coffee soluble for extraction. It will then switch off when the water reservoir is empty. It’s made with durable metal housings and BPA and Phthalate free plastics. This is a 12-cup coffee maker with a soft touch digital control panel. It has a programmable clock and timer, auto-brew option, and a ON indicator light. There is also a brew pause function, nonstick warming plate, and 2-hour auto shut off for safety. This coffee maker includes a glass carafe, removable dishwasher safe filter basket, and a water level indicator. You can even program it to start up when you wake up without ever having to touch it in the morning when you are too sleepy to think straight. It has a new and improved filter with fine mesh, and it makes 4 servings of coffee. The airtight, leak proof lid locks in freshness and flavor. There’s a non-slip silicone handle, and it’s dishwasher safe and BPA free. The fine mesh coffee filter can be used with any ground coffee and keeps grinds from falling into your brew. It’s also made in the USA. able to make iced coffee at home. This coffee maker is able to make more than 10 cups of coffee before you have to refill it. It can also brew different sizes of coffee. The strength control setting allows you to brew a bolder cup using any K-Cup pod brew size. The 5 temperature settings allow you to enjoy your favorite drink at any temperature. There’s an extra-large color touch screen. It has a digital clock. You can program it to turn on and off automatically at set times. It comes with 6 K-Cup pods, a water filter handle, and 2 filters to help your beverages taste their best. 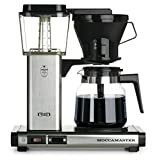 This coffee maker is SCAA certified, meaning Specialty Coffee Association of America. This means it meets the rigorous technical requirements for exemplary home brewers. It has flavor strength control, you can choose mild, medium, and bold. You can even control the temperature control, hot or extra hot. It’s able to be programed for 24 hours. It has an auto on, adjustable auto off, and self-clean. This coffee maker gives a grind for drip/manual brew and also grinds fine enough for espresso. It has 40 individual grind settings from fine to coarse. The efficient DC motor keeps your beans cool, even during extended grind times. There is a combination of electric and gear speed reducers slow the burr to 450 RPM. This ensures a smooth bean feed and reduces noise, heat, and static buildup. A convenient front mounted pulse button makes it easy to grind on demand into your brew basket. ADJUSTABLE BREWING OPTIONS. 12 cup capacity with bold, regular, and 1 to 4 cup brewing options. This coffee maker is easy to fill. It has a rotating base that lets you access the rear water reservoir. 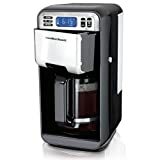 It has adjustable brewing options – you can choose between 1 and 4 cups and bold or regular flavor. With a touch of a button, the brew basket will release from the front for easy filling of your grounds. It comes with a programmable clock, meaning you can set it up the night before so you can wake up to it brewing in the morning. The automatic pause and serve will let you grab a cup during the brewing without there being overflow. The removable filter basket lifts out for fast and easy filling and cleaning. It has a pause and serve option that lets you pour a cup of coffee while it’s still brewing. Duel water window shows the amount of water in the reservoir. The on/off indicator light lets you know when it’s on. You can delay the brewing so that it starts when you wake up. the price, and the brew pause feature. This coffee maker can brew up to 5 cups of coffee at a time. The filter cone sits inside decanter making it more compact and easier to use. The water reservoir is concealed and removable, and it has an automatic warming function. It comes with a replaceable water filter, measuring spoon, and user manual. This coffee maker can brew a full pot of coffee in 3 minutes. It has an always hot internal water ready to brew hot coffee on demand. 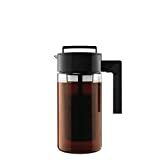 Its drip-free carafe with a propriety lid and spout design that arcs the pour of the coffee into the cup. It wicks the coffee dribbles back into the carafe preventing a mess on the cup or counter. The multi stream spray head showers hot water evenly over the coffee grounds. The large flat bottom filter and funnel lets great interaction between hot water and coffee grounds for better flavor extraction. Did any of these coffee makers catch your eye? It’s best to get all the info you can about these machines so you can think about how well it will fit in your kitchen and your life. Do you need a smaller machine? Do you want a quick brewer, or do you not mind how long it takes? Do you want a water reservoir that can come out or do you prefer one that’s attached? These are the kind of questions you should ask yourself before buying one. Also keep in mind that you should make up a budget. These machines have a wide range of prices and can get expensive pretty quickly. 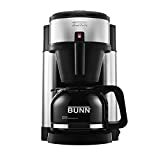 There are so many coffee makers out there, that with a little research, it should be easy to find the best coffee maker for you. You can choose been a fancy machine with lots of features or you can go with a simple and easy one. Just because it’s simple doesn’t mean it’s not good. Make sure to read the reviews. People don’t hold back about whether they like the product or not. They will highlight what is best and worst about each of these machines. Remember, this machine will get you up and running in the morning, every morning – so pick out one you truly love!